Have you already shared your own calculation tool? And above all, are you ready to share it? This is the debate of the month that you could answer in this article. This month in our community we will introduce Gunther, a member who has written an article about arc flash for the blog some weeks ago. We also are going to ask you to help some members who have no answer to their topics launched in the forum. By the way you can also respond to Fred’s blog article “Schneider Electric sells products with fuses… LOL“. Are you ready to share with other members? As mentioned previously, we recently opened our first private sharing area, to share Electrical Calculation tools between members. It is a real success, as already 14 tools are accessible to the members who have chosen to share their own tool. 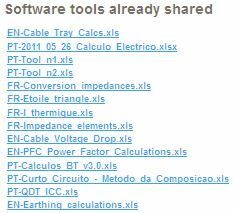 Do you feel ready to share your own electrical calculation tools today, or other useful tools for electrical engineers, with other members? Each month some topics stay without answers in the forum. Could you help those members with their issues? Maybe next time they will help you to resolve your own questions! Kaushal has to decide of a cable amperage and needs your help to this end and Awelch wonders if it is possible to produce enough energy or current with batteries in order to power an electric cooler, because he sometimes does camping. Ahmad Habli wants to know what is the minimum distance between a 220kV transmission line and buildings underneath and which risks could exist for health (especially for children health). Pierre wonders why, in Mexican streets, he sees transformers on poles fed by 3 HV phases with 4 output connectors whereas he has never seen that in Canada. Osama Salem needs some information about three phase voltage regulator to prepare his Master. Thank you for helping them! Gunther is a recent member who has published an article in our forum in September. This article is named “Arc Flash: are NFPA 70E and IEEE1584 dangerous?” and it has created an interesting discussion in the forum. Gunther has 20 years of experience in electrical engineering, and works for a consultant in his country, Germany. He is currently working on the extension of the electrical installation of a site in Europe, owned by a large American industrial group. He says he is interested in all the subjects evoked in the community and likes to visit the forum to learn new things or to get new ideas. He tries to visit the community at least once a week and hopes he could have a bit more time to participate more in the forum or to write new articles. or copy this trackback: http://engineering.electrical-equipment.org/last-month-main-subjects/missed-something-here-are-november-main-subjects.html/trackback from your own site. Brilliant post, so many people a willing to take from the community without ever giving back, as soon as my tool is completed I’ll be sure to stop by and post it.